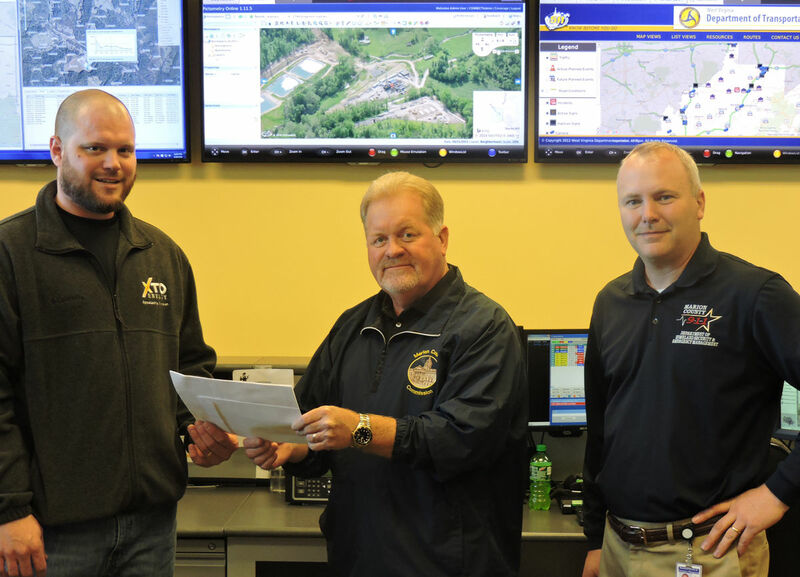 XTO representative Jay Newell (from left) present Marion County Commission member Randy Elliot and direct of Marion County Homeland Security and Emergency Management Chris McIntyre a $2,500 grant to continue updating the Marion County 911 Call Center's technology. FAIRMONT — The Marion County 911 Center has received a $2,500 grant from XTO Energy Inc.
XTO Energy Inc. is an energy company that specializes in drilling and producing natural oils. It has been partners with the Marion County 911 Center for the past few years and presented another grant of $2,500 in the past. Jay Newell, a representative for XTO, offered the check to Elliott and Chris McIntyre, director of Homeland Security and Emergency Management. XTO partnered with the 911 Center to help train first responders how to respond to Marcellus emergencies. The 911 Center also monitors drilling. “What we use this technology for on their part is we can monitor these situations if we would have something arise with the chemical industry or gas well or pipeline,” said McIntyre. The grant money previously was used for updating technology at the 911 Center. This grant will have that same use. Past grant money was used to purchase new technology like monitoring screens and a new CAD system. The grant money was also used in the process of creating the program Smart 911, which is a system in which Marion County residents can register that will automatically bring up their name and information like medications they take, their address and what types of cars they drive when they call 911. “The name of the game is speed, getting a first responder there as quick as they can,” said Elliott. Elliott said XTO is a good corporation teamed with Marion County. Email Hannah Rosche at hrosche@timeswv.com.